In America, the richest nation on Earth and host of every Super Bowl in history, there's a lot of people whose wealth laughs in the face of what it means to have money. Moreover, every state has someone who occupies the very elite perch of "richest person." So, to best illustrate how the wealthy sit atop the American landscape in the seclusion of very big houses, Howmuch.net compiled a map of the richest person from every state, dating back to business iconoclasts like Henry Ford and J.P. Morgan. To gather the data, the cost information site combed through reporting by Forbes, a prestigious business magazine that documents the incalculable wealth of a select few Americans every year. Some familiar names are here, such as Amazon CEO Jeff Bezos (New Mexico), Sergey Brin, co-founder of Google (Maryland), and Michael Dell (Texas), founder of the computer company of the same name. You'll notice, however, everyone included on the list is placed in their home state -- not the state where they made their fortune. (You'll also notice it's color-coded: the darker color signifies how wealthy the person is). As Howmuch.net explains: "In other words, clearly sometimes people have to move to make a fortune. 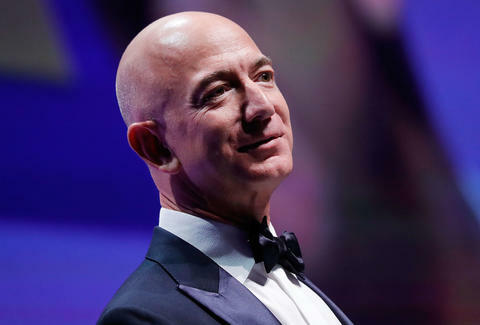 Jeff Bezos is originally from New Mexico, but Amazon is headquartered is in Seattle, Washington. Sam Walton may have been born in Oklahoma, but his company (Walmart) is headquartered in Arkansas." 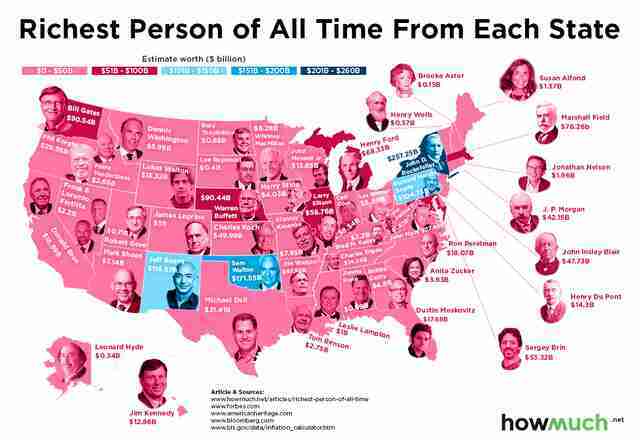 Interestingly, not every state has produced a billionaire. North Dakota's Gary Tharaldson, for instance, is only worth a measly $0.88 billion, even after founding a sprawling business empire. Brooke Astor, the socialite and distinguished richest person from New Hampshire, survived to the age of 105 on $0.15 billion. How did these people live?